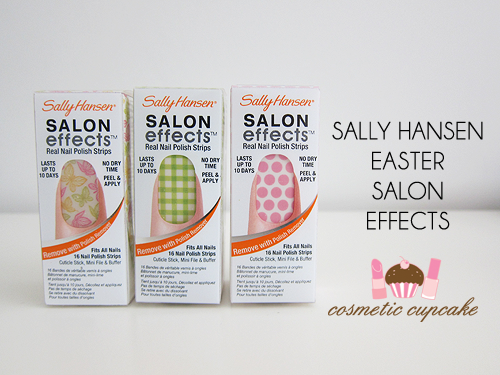 This year Sally Hansen released some ADORABLE limited edition designs in their Salon Effects real nail polish strips range for Easter. I very excitedly tweeted about them when I came across them in Chemist Warehouse last month so you imagine my excitement when I was kindly sent some to try out! Squealing may have ensued haha. There are 5 designs available - All-A-Flutter, Pink-A-Dot, Mad For Plaid, Not A Peep and Checker Out. 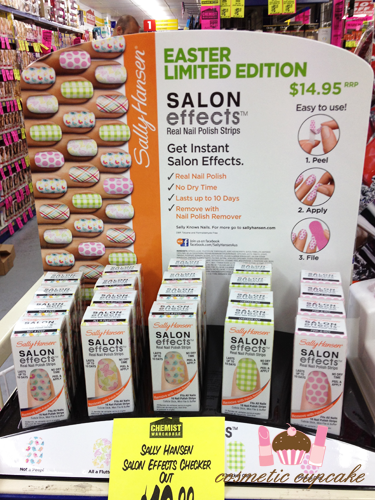 "Salon Hansen's revolutionary nail design product SALON EFFECTS introduces new designs to celebrate Easter. These 5 Easter themed looks for your nails, are easy to achieve at home and offer incredible, ten day staying power. Peel and apply strips of real, long-lasting nail polish in just minutes at any time, any place to dress up your nails with no mess and no hassle. Complete your cute and chirpy look with fun designs that would take hours in the salon to create but are possible in minutes at home. Each strip is a quick and easy fashion statement for your finger tips." I was very kindly sent All-A-Flutter, Checker Out and Pink-A-Dot. I only had time to test out Pink-A-Dot unfortunately as I have to change my nail polish regularly! 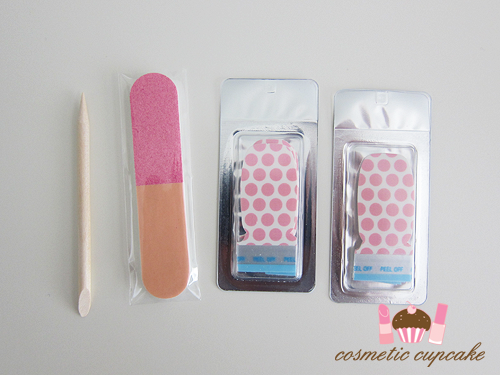 Included in the kits are a cuticle stick, a mini nail file/buffer and 16 nail strips in varying sizes. I am sure the reason why they include more than 10 strips is because you are BOUND to stuff one or two up so it's good to have spares! 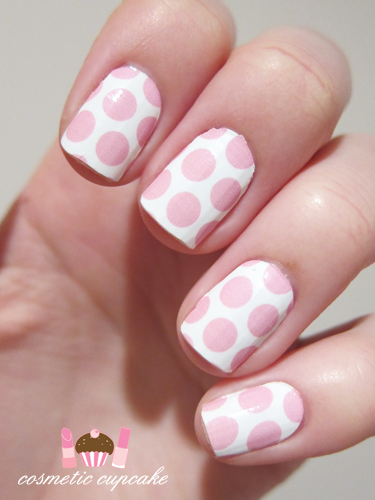 Pink-A-Dot strips have larger than usual pastel pink dots over a white base which I think are just SO adorable!! You know I'm a huge sucker for dots! This design is so sweet. Overall: I'm in 2 minds about these. The good: The designs are simply adorable (the chick design in particular!) and they are a fantastic way of doing cute nail art without the hard work. I got SO many compliments! They have a decent range of nail strip sizes and they are actually big enough for my large nail beds yay! Ladies with smaller nail beds will need to trim these down a bit. The strips are relatively easy to apply and I'd say quicker than applying polish + nail art + dry time. I really tried to wear test these but I only lasted 4 days - wearing the same mani for that many days just drives me crazy! They didn't chip or peel or scratch in that time and would have lasted much longer. I treat my nails like absolute crap at work and these definitely stood up to the wear and tear when a normal mani would normally chip. I love that these are dry so when I apply them I can type/tweet/scratch my head/go to the bathroom and I won't wreck my polish! I love nail strips for traveling because they last for ages and you don't need to bring so many bottles of polish. The not so good: Removing these is terrible. You use normal polish remover and it becomes a huge sticky mess. I spent more time removing it all than I spent doing the actual mani! The goop got all over my fingers and I must have used 4 cotton pads instead of my usual 1 to remove a mani. This wouldn't make it ideal for traveling compared to other brands which just peel off. The strips are a little thin which means they're very flexible but harder to control when placing on the nail. I found they tore easily - I tore 2 strips which made them unusable and my ring finger actually has a small tear which you can't see properly in my pictures. I found the quality slightly inconsistent and some of the strips had an uneven edge at the cuticle when you pulled the tab off making it look a bit messy. When I filed the tip down, the strip filed unevenly making it unaligned so it was as though I had tip wear. This was probably user noobness though! I also found they creased easily even though I took care to smooth them down firmly. The price point is also slightly high considering you can only get one wear out of them as these are real nail polish and will dry out. However, the designs are really adorable and perfect for Easter. I wish they were a little thicker so that they're easier to work with and don't tear. You need to take more care when applying them and have a bit of patience! 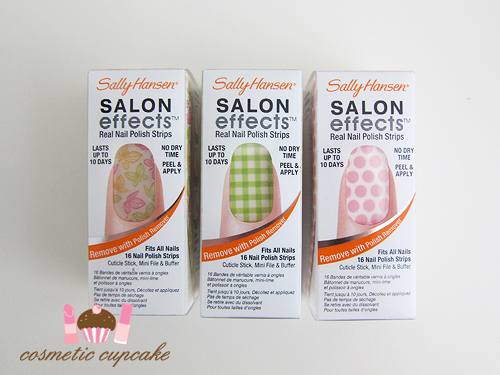 Details: Sally Hansen Easter Salon Effects are available now in 5 designs from Priceline, Priceline Pharmacy, Target, David Jones and selected pharmacies nationally for a limited time only for $14.95. For stockists please call 1800 812 663. The display at Chemist Warehouse! this is great for people who like nail art but could not make it like me....an easy way to have a nail art. Been staring at these for ages! Will give them a miss tho, hopefully they'll take your review on it into consideration and improve it :D love them on your nails tho! Glad you like them! They are really cute. Just wanted to let you know, you put the stickers on backwards. The side opposite the pull tab goes to the cuticle. That is probably why you experienced poor quality with this product. If you put them on correctly you won't run into this problem. However, creasing is a problem I experience all the time with these. There is a learning curve. If you follow the directions, you should have no problems in the future. Hi Felicia, thanks for your application tips. I'm one of those people that read the instructions for products religiously so it's interesting you say I didn't apply them "correctly"! From what I understand of the instructions, it suggests you choose the side of the strip that fits your cuticle best. I found that the side with the tab fit my cuticle best so for me I didn't apply them backwards for my nails.